Four men in the UK have received sentences of up to four-and-half years for running a torrent site that leaked movies online, sometimes in advance of their theatrical release. Most notably, the quartet shared The Expendables 3. All four pleaded guilty to defrauding Lionsgate Films and members of the MPAA to the tune of $11.2m. Running a torrent site anywhere in the Western world was once an extremely risky endeavor, with prosecutions regularly hitting the headlines. These days there appears to be less law enforcement and civil action than there once was but for four men in the UK, their actions several years ago have now caught up with them. Steven Pegram, 40, Mark Rollin, 37, Paul Taylor, 54, and Alan Stephenson, 42, were part of a group which uploaded movies to their relatively low-profile torrent site, TheFoundry.name. Importantly they also made movies available before their theatrical release, notably The Expendables 3. The movie leaked in so-called ‘DVD Screener’ format during July 2014 and was downloaded millions of times before its official release August 15, 2014. In November that same year, the UK’s Police Intellectual Property Crime Unit revealed that two arrests had been made in connection with the leak. The men were aged 33 and 36, the same ages as Pegram and Stephenson would’ve been at the time of the arrests. Information now provided by the UK’s Crown Prosecution Service states that Pegram, Rollin, Taylor and Stephenson shared the movie on their platform, causing producer Lionsgate Films an estimated £1.5 million ($2 million) in losses. Other movies made available on the site affected members of the MPAA, including Sony, Disney, Fox and Warner Brothers. Their losses were calculated at £7 million ($9.26 million), with Godzilla and X-Men: Days of Future Past accounting for almost £4 million ($5.29 million) of that total. According to the prosecution, Pegram owned the site and along with Taylor, paid for its servers. Both men uploaded content to the platform. Rollin acted as an encoder and uploader and was found to have 47 “high quality” movies on his computer, including the titles Are You Here and Third Person, in advance of their theatrical releases. Stephenson was responsible for setting up and maintaining the torrent site. Rollin and Stephenson earlier pleaded guilty to conspiracy to defraud the copyright owners. At the first day of their trial on December 3, 2018, Pelgram and Taylor pleaded guilty to the same charge. The quartet were all sentenced yesterday, with Pegram receiving a prison sentence of four-and-a-half years and Rollin a sentence of three years. Taylor and Stephenson were each sentenced to two years imprisonment, suspended for 24 months. “These defendants set up and ran a site which allowed users to download films for free via BitTorrent, including the Expendables 3 before its release in the cinema,” said Leigh Webber, a Specialist Prosecutor in the Specialist Fraud Division at the Crown Prosecution Service. The saga surrounding the leak of The Expendables 3 has now been running for almost five years, with several individuals, groups, and platforms being held responsible for its distribution. In August 2014, file-hosting site Hulkfile threw in the towel in the US after being targeted by Lionsgate after a user stored the movie on its servers. Almost a year later, file-hosting site Played.to reached a settlement with the movie company after users streamed the movie illegally. 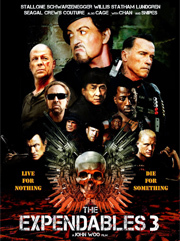 In March 2016, United States District Judge Otis Wright granted a default judgment which ordered Muhammed Ashraf (LimeTorrents), Tom Messchendorp (Dotsemper), and Lucas Lim (Swankshare) to pay the maximum statutory damages of $150,000 each, again for offering The Expendables 3. Then last December, a federal grand jury in California indicted five men for allegedly offering pre-release copies of hundreds of movies and TV shows via the Internet, The Expendables 3 included. The indictment revealed that at least one of the men stands accused of accessing the California-based servers of a content-management services company which was used to store and distribute motion picture assets. In 2013, the Police Intellectual Property Crime Unit (PIPCU) informed TorrentFreak that The Expendables 3 had been “stolen” from a “cloud-based system”, something which supports the information released in the indictment. The unit later revealed they’d arrested a then 26-year-old man in the UK during April 2015 under suspicion of leaking The Expendables 3. While it is still to be officially confirmed if it is indeed the same person, Malik Luqman Farooq (placed at 30-years-old in December’s indictment and said to be resident in the UK), is mentioned prominently by the Department of Justice in the US. The indictment claims the unreleased copy of The Expendables 3 was obtained from a content-management services company and downloaded via TOR. The copy was then stored on an OVH server with Farooq later selling it to an undercover anti-piracy investigator working for the MPAA.